"An elegant way to present your logo or custom design." Discover why Kingpins is the "king" in our field and a 100% Satisfaction Guarantee too! Did you know that Medals date back to the 4th century BCE? Our die struck medals are filled with color as required and baked at 450°F. Similar to medals, medallions are typically larger with ribbons. How are Custom Made Medals Made? KingPins realizes how important it is for your group to create a custom medal that not only looks amazing, but also serves as a reminder of achievement. We know that there are a lot of reasons why medals are rewarded. 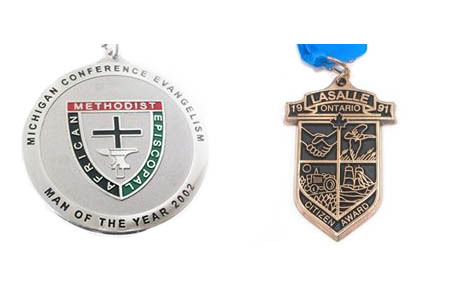 With 51 years experience as an industry leader, we are experts at capturing your story in the form of a medal. Our talented sales representatives will help you determine your needs and budget to come up with a plan that works for you. KingPins designers are experts at incorporating your group’s current logo into a custom medal design. We also have a lot of experience in working with you to create a brand new logo for your group or event. 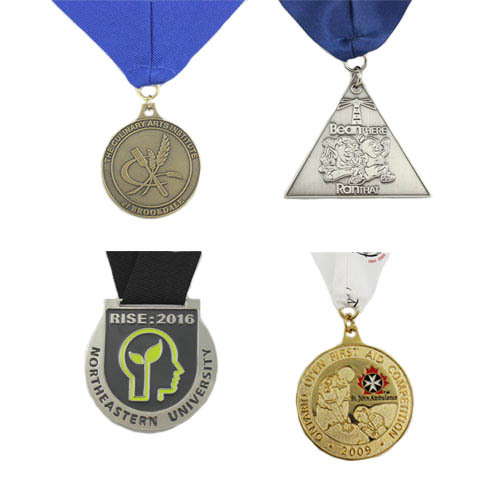 After we determine what design you want on your custom medal we will quickly walk you through the rest of the medal creation process. You then decide on the material you want your medal to be made of as well as the size and shape of your medal. 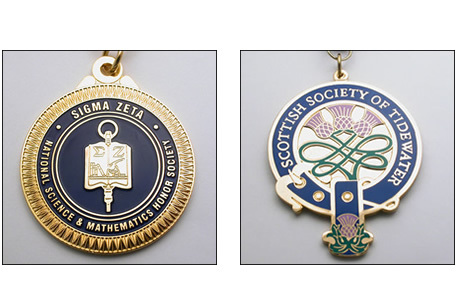 Creating your own custom made medallion has never been easier. Kingpins has provided medallions for all kinds groups around the world and we want to bring our world-class experience to your group with our custom made medallion service. We know that for every different medallion there is an equally unique story behind it, that's why Kingpins’s experienced design team wants to create a medallion worthy of any recognition, award, or team promotion. A medallion is an engraved medal worn around the neck that serves as a reminder of a special event or achievement. With a custom made medallion you can instantly relive a hundred memories and have a treasure keepsake. With nearly 40 years experience, we at Kingpins know how to use a custom made medallion as a way to communicate your group's messages and achievements. Medallions are often designed to attach to a broad collar, which may be short or long in length, or to attach to a bow, ribbon or rope. Collars can range in quality from a ribbon to heavy, ornate chains of precious metals and stones. Today, the term medallion is often used interchangeably with medal, and may sometimes refer to large coins. 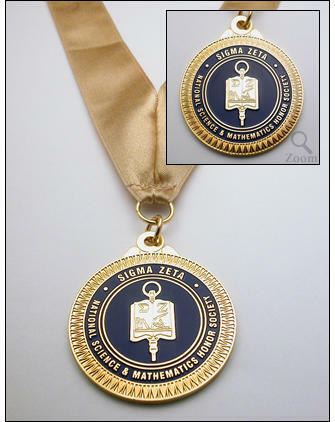 However, a medallion is more substantive then a medal, in size, thickness, and weight. The size of a medallion allows the artist to create large, bold, or elaborate custom design. How are Custom Medallions Made? 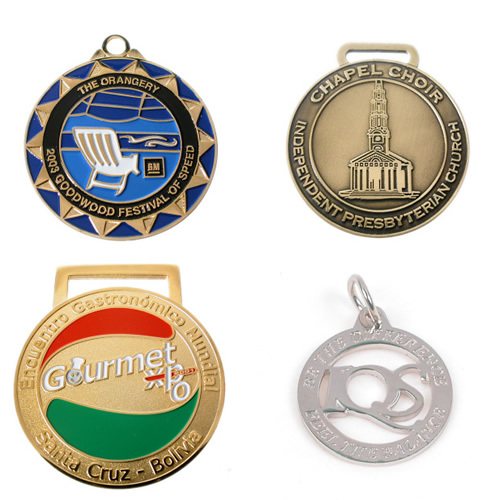 We produce world class medallions by working with you. 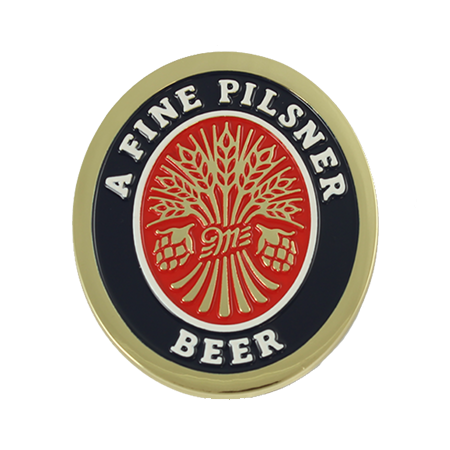 Kingpins works with our customers to bring their custom medallion ideas to life. Our talented staff will walk you through the design process and make you feel confident and excited about your groups custom made medallion. You decide the size, material, shape, style and color of your medallion. It doesn't matter if you already know what you want your medallion design will look like, or if you're still unsure, Kingpins will make the creation of your custom medallion easy. All of your group's logos and designs are kept in the strictest confidence. We will work with you to make a medallion that incorporates your current insignia, or if you want our design team will work with you to create something new. 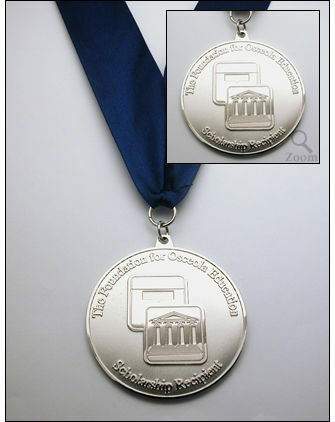 Together we will create the perfect medallion that fits your group's needs and budget. The artwork and design of your custom made medallion is free and we will provide you with a full-color proof of your project at no charge. We at Kingpins know that you want your medallions to arrive to you quickly, that's why we will ship your medallions to anywhere in North America with FedEx free of charge. If for some reason you are not happy with your custom made medallion Kingpins 100% satisfaction guarantee for all of our medallions. Custom Medals date back to the 4th century BCE. The first documented use of a medal was in the 4th century BCE. Alexander the Great offered a golden button as a gift to a prominent Jewish high priest. Throughout time, the use of custom medals shifted to being a symbol of importance and wealth. During the Middle Ages, the powerful made custom medals which were embossed with their portraits. These medals served as gifts, but more importantly they told others of an alliance with the person on the medal. Is there any better symbol of achievement that stands out better than a medal? A medal not only serves as a reminder of success, but it is something that can be worn proudly and passed down to future generations. Medals can be awarded for success in athletics, academics, military and many more efforts. Militaries around the world created custom medals to signify achievement and service to their country, this tradition is still very much alive today. Higher ranking military officials proudly decorate their uniforms with medals gained from a vast amount of achievements. Medallions were often used to identify success and importance. In the Middle Ages the wealthy and powerful would engrave their portraits and emblems on medallions. Medallions were custom made, with various designs, sizes and materials used. The militaries around the world continue to use medallions as a way to showcase achievement, rank and nationality. Medallions are coveted by athletes as a sign of perfection in their sport. Early examples of European collar regalia date to Middle Ages, c.1300, in France and England. Small bronze medallions were used in Roman times, as early as c.100 to commemorate some victories by Trajan. Medallions, at first, were a Royal symbol of position, power, wealth, or ownership for a limited number of people. Since the beginning of time the medallion has been used to tell stories of accomplishments and important events. Kingpins wants to keep that tradition alive by working with you to create a custom made medallion that will instantly unleash a hundred stories and memories, a worthy keepsake to be treasured. We have a variety of colours available in fabric or satin. You can also add custom printing! The KingPins Award Winning Difference! How do we ship your order? As soon as we receive your custom product, we inspect it and then ship it to you the same day. Your automatically receive tracking details!